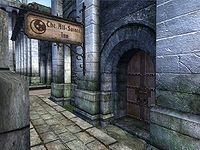 The All-Saints Inn is the only inn in the Imperial City's Temple District. It is found adjacent to the gate to the Talos Plaza District and next to Gilen Norvalo's House. The publican, Willet, buys potions and food while selling only the latter. The ground floor contains the reception area consisting of bar with a counter and a dining room while the rooms are in the basement. Two Mythic Dawn sleeper agents, Styrbjorn and Marguerite Diel, can be found here after the Dagon Shrine quest when they're not attempting to find and assassinate you. The second floor contains Willet's private quarters, as is usual with Imperial City houses and stores. If you pick the lock you will find two beds: a single and a double, both of which you are free to sleep in. In the basement you can choose between the three available rooms: all are well-lit and contain a bed, chest of drawers, and a table with food. Esta página foi modificada pela última vez à(s) 18h40min de 17 de novembro de 2013.